The Tidal Wave ends with a wall of water coming over the boat you’re in. Full disclosure – at theme parks I’m that person that holds everyone’s bags and coats while they go and have fun on the really massive, hugely terrifying rollercoasters. So how did I find myself at Thorpe Park, for not just one day but two? I’m not entirely sure, but with three friends I embarked on a weekend that was full of hot weather, plenty of water rides, some dizziness, and even one massive rollercoaster, all of which amounted to a fun two days. 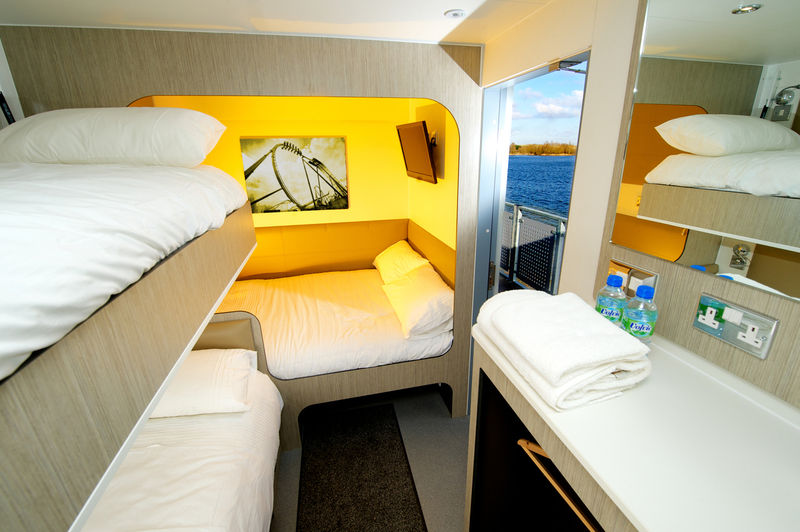 We arrived at Thorpe Park as it opened on the Saturday, parking in the car park for those staying at The Crash Pad, the amusement park’s new “hotel” – it’s located on the park with rooms made out of old shipping containers. More on that later. After picking up our tickets, collecting locker tokens and stashing our bags, we headed into the park, which was already pretty full – it seems the hot weather had drawn the crowds. We decided to start with something easy, so picked Quantum, which one friend described as a bit like a magic carpet. How wrong she was. You sit down in your seat, pull the safety bar over your lap and then the ride, which swings from front to back before going over the bars (it never goes upside down), starts. It sounds so innocent, but it’s scarier than it looks, because your back isn’t supported at all. I felt like my head was going to fly off my shoulders, and my friends didn’t fare better. Next to Quantum is Rush, which we all queued for, before me and one of my friends chickened out. We’re so glad we did. Rush is like a giant swing, full of people who are either gritting their teeth or screaming in fear. One of my friends, let’s call her N, crossed herself before the ride started, and she’s not even that religious. With the sun shining down, we decided to cool off by heading on to Storm Surge, which is a water slide of sorts. You sit in round dinghy things, which take you up a steep slide, before you twist and turn down a flume back to the bottom. We weren’t expecting the dinghys to spin so much, but it did make us all laugh. With our feet wet (literally) we headed onto Tidal Wave, a ride where you’re warned you’ll get very wet. That is a huge understatement. 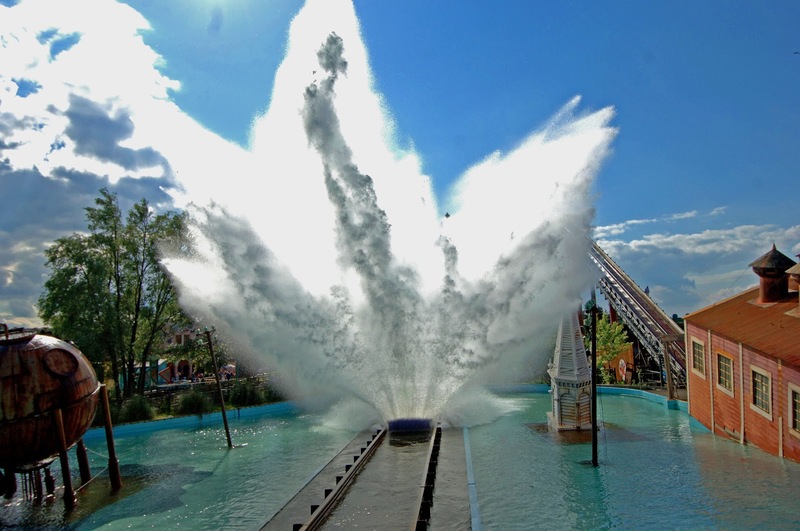 Tidal Wave is an amped up log flume, and the wall of water that comes flying up at you at the bottom of the ride is…refreshing, to say the least. It was easily the best ride we went on (in my opinion), simply because it was so funny. And made funnier by the fact that my friend V, who wore a cagoule during the ride and managed to escape getting soaked then, managed to get soaked while walking away from Tidal Wave, after she’d taken her protective layer of clothing off and another boat came down the ride. A quick break for lunch (Thorpe Park offers the standard amusement park fare) and mostly dry, we decided to be a little more adventurous. I say we, I mean N and F. They headed onto Stealth, a ride which boasts that it takes you from 0mph to 80mph in 2.5 seconds. They ended up going on it again later in the day, this time managing to keep their eyes open and enjoy it, rather than being caught out by the speed. Nemesis Inferno, one of Thorpe Park’s rollercoasters, was terrifying. It was then on to my nemesis, Nemesis Inferno. After being peer pressured by N, V and F, I found myself being strapped into my seat. The first 20 seconds of the ride were fine, we headed out, the seats moved to the side slightly, it was all good. And then we started going faster, there was some spinning, some going upside down, some looping the loop and some going backwards. I squeezed my eyes shut and screamed at a pitch that probably only dogs could hear the whole time. It was terrifying, I hated it, I’ll never do it again, but it was weirdly fun and I’m proud of myself for surviving. From there, we made our second attempt at getting onto X (a fire alarm went off the first time we tried earlier in the day). X is a rollercoaster/train ride in a dark warehouse with strobe lights and loud music. It was the least impressive ride of the day, because it didn’t offer any thrills, and because on such a gorgeous, bright day, it’s a pity to be inside for any length of time. We tried a couple more water rides, Logger’s Leap (the actual log flume), and Rumba Rapids, both of which made us all smile, before my three friends headed on to Colossus, which loops the loop about 10 times. The picture I managed to catch of them shows them on a scale of fear to fun, and made me laugh. 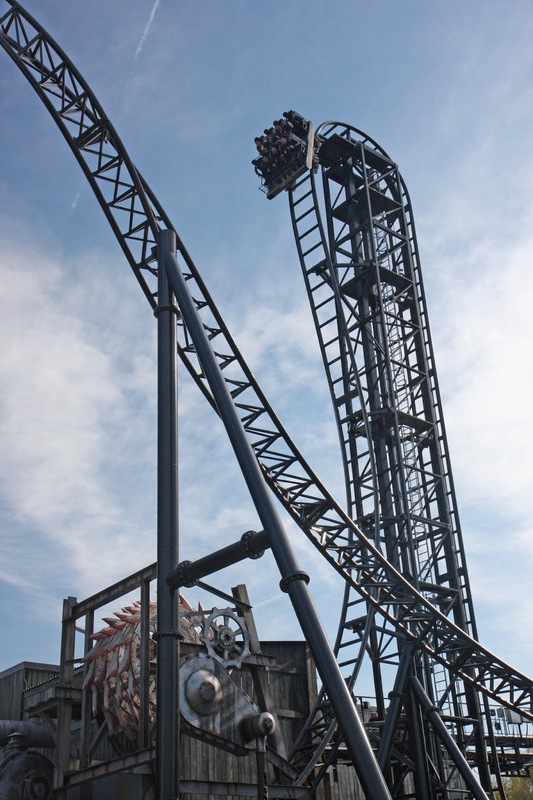 Saw – The Ride offers a vertical drop. N and F headed onto Saw – The Ride, a rollercoaster which has a section where you’re taken up practically lying back, and then hurtle down almost on your front, while V and I headed onto Tidal Wave again. The Crash Pad can sleep four to a room. And then, as thousands of people left the park for home, it was time to check in to our room at The Crash Pad, which overlooks a lake. The hotel isn’t for people who like a lot of space – the rooms are tiny, with a double bed and a bunk bed, and a wet room/bathroom. Once all four of us were in there wasn’t room to move. Still, we were prepared for the smallness. What we weren’t prepared for was how lovely the room was in spite of its size. The bedding was super comfortable, there was a flat screen on the wall, the toiletries and towels were of high quality, and The Crash Pad even provided bottles of water in the room. Don’t actually do this, there’s not room. A brief rest later we headed to Bar 360 on the park, where we ate dinner. Despite the restaurant’s huge size and the fact there were about 10 people serving drinks, guests at The Crash Pad apparently have to book for dinner. We hadn’t booked. After some waiting around, the kind manager seated us in a separate area and served us himself. The food is standard fare, it’s tasty but functional, there’s no frills or gourmet dining here. We hung around for a bit longer, taking part in one of the quizzes, before deciding we’d had a pretty long day and turning in. Breakfast, a continental buffet, was also in Bar 360, and we tucked into hot croissants and tea to the sounds of people screaming on Vortex (lots of spinning, we didn’t go near it). Guests at The Crash Pad get exclusive access to Saw – The Ride before the park opens, an offer we didn’t take advantage of but which plenty of others did. After breakfast, we packed up and checked out. A brief discussion later, we decided to head home, having packed in all the rides we needed to on the first day we had in the park. The Crash Pad is great for those wanting to spend two full days at Thorpe Park (families in particular) or those, like us, who didn’t want to sit in traffic the night before having exhausted ourselves. Instead, we got a good night’s sleep and headed home in the late-morning sunshine, leaving the screams from the amusement park behind. •Two day packages at The Crash Pad start from £44.50, based on four people sharing. To book call 0871 360 2629. 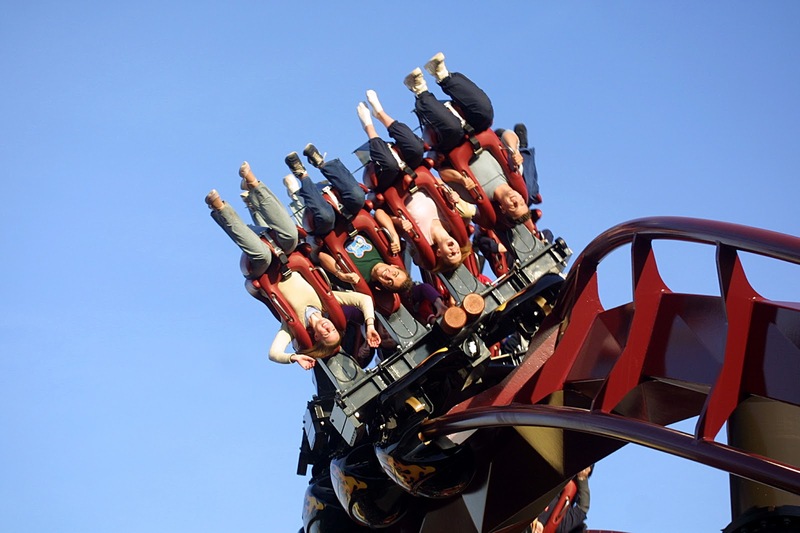 Thorpe Park is open from 10am to 6pm until August 1, with later opening hours in September and October. For more information, click here. This looks so fun. I LOVE roller coasters and anything that is fast and twirly. I'm glad you went on a couple, at least. Saw looks amazing! The hotel room is pretty adorable. It does look small, but super comfy and the sliver of the view of the lake is gorgeous. It sounds like a great time! I can safely say I hate rollercoasters, but I'm proud that I managed to survive! The hotel room was really cute, it was just a fun experience all round.